For children up to 30 lbs. $7/day $30 for 1st week. They sing, they dance and they can even change a wet bum! Our pack and plays pretty much do everything. We offer a variety of styles because we have a variety of little customers. 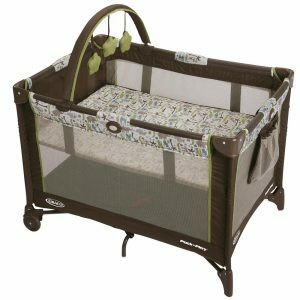 Some prefer the simple pack and play with no bells and whistles while others like to be serenaded to sleep with the soothing sounds of nursery rythmes or mozart while little bears dangle above them. For our smallest visitors there is a bassinet attachment that is available on most of our models. Please specify at the time of booking should you prefer one of those. If you’re planning to move locations while on your visit, pack and plays makes it easy. They fold up in about 60 seconds and come in their own little carrying case for easy transport into the trunk of a car. We carry GRACO model, and are replaced regularly. All are suitable for a child less than 34 inches tall and up to 30 pounds. 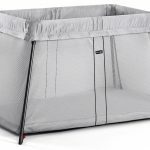 The open dimensions of the pack and plays are approximately 40″ x 28.5″ x 33.25″ so they are pretty easy to fit into small spaces. We know that most babies have their favourite blankies but we provide Kushie brand brushed cotton sheets and a cotton lined mattress pad with all of our rentals. It’s just one less item that you need to worry about! If you want help with the set up or take down, just let us know. We want to make your experience with Wee Travel as convenient and simple as possible.